I’m shocked that four months have passed by so quickly. My time here at Array has been a really great one. What a crazy semester! I have learned so much from the Array team and I’ve really grown in my writing, digital experience and understanding of how an agency works. The team has been extremely helpful in shaping me for the future. They constantly are checking in and making sure that I’m getting to do everything I want to do. Luckily, I’ve been able to experience so much within this internship. When I interview for future positions, I will have copywriting, client, SEO optimization and planning experience from the agency to talk about. I’m still not sure what part of the agency I want to work in when I enter in the “real world” but with my experience here at Array, I have skills that can be applied to each advertising discipline. Also, with the awesome designers at Array, my creative has improved some too! Being submerged in such a creative and awesome culture has really stimulated learning and it has made me really excited for life after graduation. Being “the intern” has really been a great experience. The talented, compassionate and hilarious people here at Array have made this semester memorable in more ways than one. The team is very genuine and sincere, and I know that I’ll stay in contact with them after the semester is over! I’m actually going to miss not coming to Akron three times a week, despite my rival feelings for Akron (sorry – proud Kent State Golden Flash right here!). But ROOs aside, being downtown has been a really cool place to learn and work. 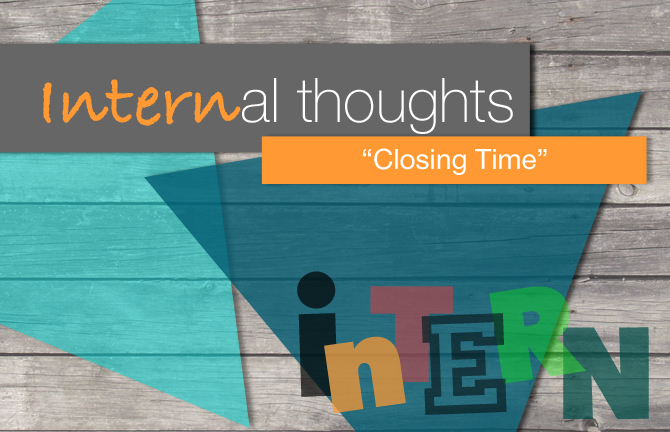 Closing my time as an intern here, my message for all students looking for an amazing experience: Go for it! I stumbled upon Array Creative last semester, and my life is better because of it. Step out of your comfort zone, go for what you want, have drive! You are good. Believe in yourself and go for your dreams.